Wow. Thanks for the review. I am currently working on a project for my instructional technology graduate program. I asked my colleagues at work what they wanted to learn how to do so that I could complete a project that would ultimately be useful to my school. Hands down they wanted to learn how to create Web sites and podcasts. I can’t see how they could navigate instructions like those. But … it has such a nice cover. Very colorful. I agree with Dana — if that piece you shared is a sample of what is in the rest of the book … ahhh. Thanks for the critical review. I agree with that – the Richardson book is by far superior. I am using it as a guide for our PD next year. We will be introducing Wikis, Blogs & Podcasts to our teachers and creating a ‘tech team’ of students (club) so that they can do all of this as well. There are some pretty exciting things going on at our school next year! Thanks for this review. I can’t believe (well, sadly, I can) that Scholastic would be so out of touch as to publish something like this. 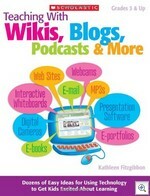 It’s great that the book advocates using these tools but I can’t imagine telling a group of 8th graders at my school (or 7th, or 6th, and it just gets more ridonkulous from there down) to attempt to “go online and find a free software tool for creating blogs,” thus abdicating (or accepting) any responsibility for the result! Most students need a LOT more structure than that, and as educators we know which blog sites are best for our students.